Bath missed a chance to reach the Premiership play-offs as they shared a thrilling draw with Northampton. Needing a bonus-point win to secure a top-four spot, Bath instead remain in third place with one game remaining. They can be denied a play-off spot by Harlequins, whom they meet next Saturday in the final round of games. 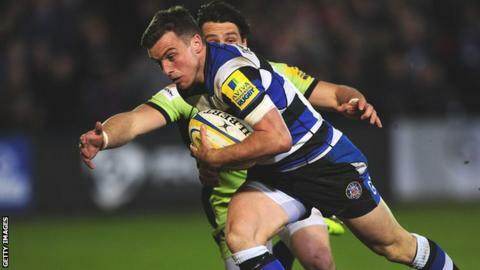 George Ford scored all Bath's points, but Stephen Myler's late penalty earned a draw for second-placed Saints, who are not sure of a home semi-final. Ford and Myler both kicked penalties in a thrilling final two minutes. Ford looked to have won the match when his kick from long-range split the posts, before Myler's immediate response. The match ended in chaos when the home side appeared to have been awarded a late penalty, only for referee Matthew Carley - following consultation with the television match official - to decide against giving the decision. Myler kicked the first points of the match as Northampton spent almost the entire first quarter camped in the Bath half. Bath and Northampton could end up facing each other three times in the month of May. Having already booked their places in the Amlin Challenge Cup final on 23 May, the sides are also potential opponents in the Premiership play-off semi-finals. Having survived the early onslaught, Bath began to have the better of things at scrum time and, on their first foray into the opposition 22, won a penalty which Ford duly converted. Myler's kick following an infringement at the breakdown restored Northampton's lead, before his opposite number successfully struck a penalty to send the teams in level at the break. Undeterred by a missed penalty after Northampton had again been penalised at the breakdown, 21-year-old Ford produced a brilliant side-step to breeze past England team-mate Courtney Lawes on the 22 and score the game's first try. His conversion was successful. The Saints response was instant, with Myler's smart offload teeing up winger Jamie Elliott to go over in the corner. The Northampton number 10 added the extras. There was confusion when Bath hookers Rob Webber and Ross Batty were off the pitch with injuries and uncontested scrums for the remaining 20 minutes looking likely. But prop Nathan Catt filled in and the hosts were instantly rewarded, winning another penalty at the scrum to allow Ford to put them ahead once more. Although Lawes was shown a yellow card for taking out Anthony Watson off the ball soon after, Myler kicked an angled penalty for Saints. But the match is likely to be best remembered for the drama that unfolded in the closing stages. Bath: Abendanon; Watson, Joseph, Devoto, Banahan; Ford, Young; James, Webber, Wilson; Hooper (capt), Attwood, Fearns, Mercer, Houston. Replacements: Agulla for Watson (72), Henson for Devoto (71), Stringer for Young (63), Batty for Webber (16), Perenise for Wilson (54), Day for Attwood (71), Catt for Batty (54). Northampton: Foden; K Pisi, G Pisi, Burrell, Elliott; Myler, Fotuali'i; Waller, McMillan, Ma'afu; Manoa, Lawes; Clark, Wood (capt), Dickinson. Replacements: Denman for A. Waller (71), Haywood for McMillian (54), Mercey for Ma'afu (54), Craig for Manoa (54), Dowson for Clark (54). Not Used: A. Day, Wilson, Collins.